Indigenous activism and resurgence are often analyzed at the state or macro-level because of the high visibility and large-scale nature of these actions. However, as Kwakwaka’wakw scholar Sarah Hunt and Cindy Holmes observe in their 2015 article, “…the daily actions undertaken by individual Indigenous people, families, and communities often go unacknowledged but are no less vital to decolonial processes.” These are challenges that we take up in examining the “everyday” – those often unseen, unacknowledged actions that renew our peoplehood and generate community resurgence. 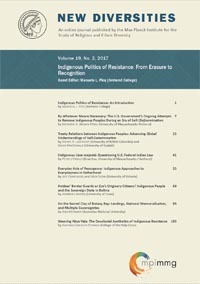 This holds important implications for decolonizing our notions of time and place and increasingly Indigenous scholars, such as Maori scholar Brendan Hokowhitu (2009), find that Indigenous discussions of the everyday tend to be framed either in terms of “Indigenous political struggles, especially in regard to jurisprudence, or in terms of ‘victimhood’ conceived of as the genealogical descendent of the trauma of colonization”. How then can we re-imagine and re-assert Indigenous everyday actions that emphasize the intimate, lived experiences of Indigenous peoples? This article examines how the everyday can be an important emancipatory site for Indigenous resurgence against colonial power. Focusing on fatherhood and the everyday shifts our analysis away from the state-centered, colonial manifestations of power to the relational, experiential, and dynamic nature of Indigenous resurgence, which offers important implications for re-thinking gendered relationships, family health and well-being, and governance. These daily acts of resurgence, at the community, family and personal levels, can be critical sites of resistance, education, and transformative change.